Photos by Clifton Li courtesy of Ryerson University. Raktim Mitra, Associate Professor School of Urban and Regional Planning at Ryerson University and Tamara Nahal, Masters of Urban Development program at Ryerson, recently published a research paper called Facilitators and Barriers to Winter Cycling: Case Study of a Downtown University in Toronto, Canada. They presented the research paper to the Transportation Research Board (TRB) at its annual general meeting in January. The TRB annual meeting is one of the largest conferences on transportation issues in the world with more than 5,000 papers presented to nearly 15,000 attendees who come from across the world. 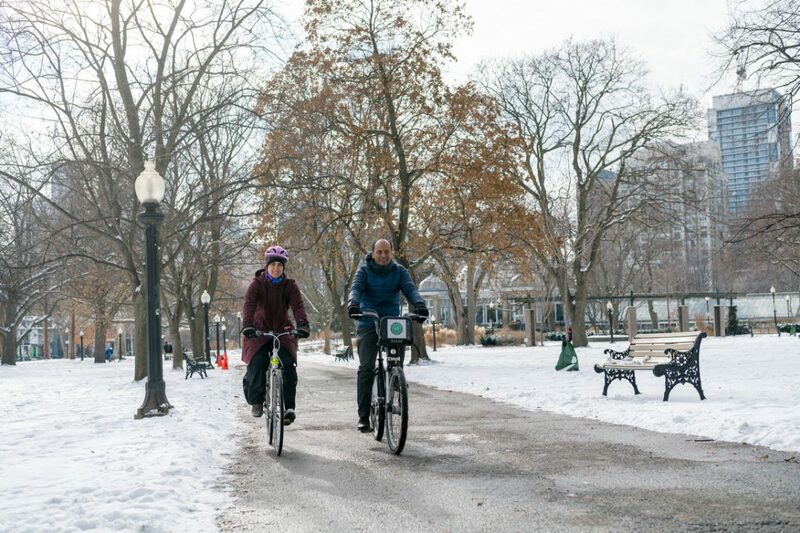 The Ryerson-based academics (and cyclists) found that an improved bicycle network could help overcome barriers to winter cycling. dandyhorse caught up with the researchers to find out more about why they decided to research winter cycling in downtown Toronto, and what they found out. Why did you decide to research winter cycling in this city? Over the past two years, we have undertaken a series of research projects focused on cycling in Toronto. The key goal is to understand current cycling patterns and behaviour in the Toronto region and identify the key barriers to cycling in order to provide better insights into the potential for cycling growth in this region and the role of urban cycling facilities in facilitating this future growth. Winter cycling is a much discussed but understudied topic that is very relevant in terms of advancing active transportation planning in this region or similar regions in Canada and North America. Some of the recent surveys that we conducted included data that allowed us to explore this very important issue systematically and we were excited to undertake this investigation. What are your top findings from this research? 27% of current cyclists (who usually bike to work or school in spring and fall) continue to bike through the winter months. It’s both a high and a low number. On one hand, a quarter of all cyclists bike all year round, so clearly there is potential for winter cycling. On the other hand, there is still a lot of work that would need to be done for more people to consider biking in the winter. The probability of biking in winter is associated with increased access to on-street cycling facilities such as bike lanes and cycle tracks near the shortest route of travel. Women, compared to men, were less likely to bike in all seasons. We found a statistical association between the amount of cycling facilities (measured as the km of cycling facilities present within 500m of the shortest route of travel, per km of travel distance), and the probability that a cyclist would commute by bike through winter months. Based on this result, it is reasonable to imply that more on-street protected bicycle facilities connecting neighbourhoods to downtown might increase the number of winter cyclists in the city. We did not explore the maintenance issue due to absence of data. Are short distance rides correlated to an increase in winter cycling? 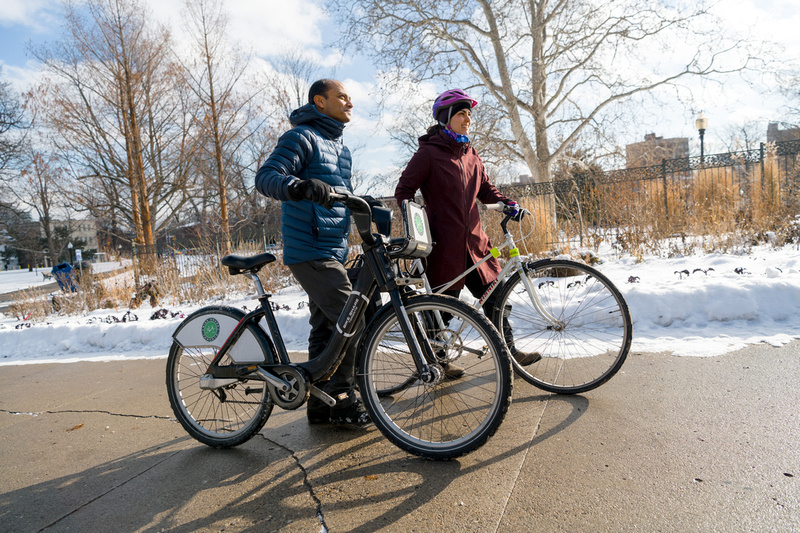 Can Bike Share play a role in encouraging short-distance winter cyclists? We did not find an association between travel distance and seasonal variation in cycling. Among the current cyclists, distance was not a barrier to winter cycling. Regarding bike sharing, a small portion of our sample used it to get to and from campus, so we could not investigate this too thoroughly. Do you think your research might be skewed higher than the general GTA populations due to the higher number of cycle tracks (Sherbourne, Gerrard) near Ryerson? We think that our sample is generally representative of cyclists who commute to downtown Toronto or other similar urban locations. Suburban communities may have different challenges, particularly in the context that biking rates have actually gone down outside of Toronto over the last 10 years. We believe that bicycle facilities that would connect residences and destinations can be part of the solution in improving cycling rates in other GTHA municipalities. But we cannot conclusively comment on the applicability of our findings relating to winter cycling in a suburban context. What do you think the City of Toronto could do to improve comfort levels for cyclists? Many years of professional and community-based advocacy has led to a favourable policy environment that enables cycling through policy and resources. The City of Toronto’s Cycling Network Ten Year Plan (2016-25) calls for >500km of new cycling infrastructure, which is going to cost between $12 million and $25 million annually. More recently, Toronto has received $25 million in funding from the Province for implementing its cycling infrastructure. Numerous studies have shown the importance of separated on-street cycling facilities in improving safety of road users. Our results suggest that bike facilities are critically important in enabling year-round cycling. We trust that this work will strengthen the professional and grassroots advocacy in securing popular and political support in creating a more complete bicycle network in this city and the region, and maintain them throughout the year. If planners (and municipal politicians) are so focused on only investing in infrastructure that is only used year-round… why aren’t all the pools in the city shut down? It is important to recognize that when comes to usual transportation modes, cycling is the only one that is considered by some as “seasonal”and looking at current travel behaviour, this popular perception may not be unreasonable, because only about a quarter (27%) of cyclists retain their travel mode in winter. A broader question to ask is, when walking rates don’t decrease as much (88% pedestrians continue to walk to work/school during in winter), why do fewer people cycle in colder months? I think that part of the problem is a culture of mobility where cycling is often seen as a “recreational” activity, which can only be performed in good weather conditions. Most people do not have -- or think they don’t have -- the necessary preparations or proper clothing that is necessary to cycle in rain or in winter. But more importantly, cycling is the one mode of transportation that has been most neglected in the ways in which we have planned our streets and urban spaces. In poor weather and adverse climatic conditions, it can be dangerous to bike in the absence of a dedicated road space that separates bicycles from faster, bigger cars, when those road spaces aren’t maintained during the winter. Perceived safety conditions during winter months is likely a key barrier to cycling, and this is where planners can make a difference by providing facilities that would enable cycling throughout the year. Raktim: I’m a seasonal cyclist, who mostly bikes from Spring to Fall, and mainly for commuter trips. Tamara, could you tell us more about your cycling advocacy work in Ottawa? I got my start in cycling advocacy when I was a student at Carleton University. I helped found a campus advocacy group called C.U. Cycling. We were interested in improving cycling routes and connections to the university and thinking about how to make it easier for students to get around the city by bike. I also got involved in my neighbourhood’s cycling committee and helped us secure funding for a wayfinding project. I was already interested in urban planning at the time, but getting involved in cycling advocacy helped me more deeply understand a specific transportation mode while also recognizing the importance of multi-modal transportation. We should not lose sight of the significant gender gap that we observed in terms of the willingness to bike in winter months. Based on what we have seen in other research, it appears that improved (i.e., separated and maintained) cycling facilities can increase biking among women in general and also in winter months, which is critically important in improving cycling rates in this region at a population level. Currently, only about a third of the cyclists are women.